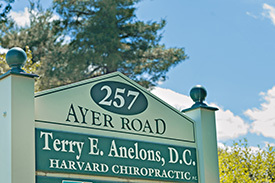 Dr. Terry Anelons is originally from the nearby town of Stow, and chose to open his practice nearly three decades ago in Harvard. At our office, your care will start out simply and effectively, to let you feel all the great effects of beginning chiropractic care. We’ll check the movement of your body, especially problem areas, and your care plan is designed to get the function back to the area of your injury. We want to help restore function to your body. When you’re having pain or discomfort, it’s because there is something in your body that’s inflamed or restricted. Chiropractic care helps your body release that restriction, allowing you to start moving freely again. The muscles around your injury will start moving again the way they’re supposed to, and your nerves will transmit messages efficiently. After your nerves receive the benefit of our care, some of the additional benefits of chiropractic can include: sense of well-being, better immune response, improved breathing and digestion and other improvements in your overall health.